THESE EQUATORIAL PLATFORMS CAN BE USED FOR ALL TYPES OF ASTRO-IMAGING WORK. A SINGLE-AXIS PLATFORM, for instance, is quite suitable for LUNAR AND PLANETARY PHOTOGRAPHY through the main telescope. PIGGYBACK PHOTOGRAPHY (taking long- exposure pictures with a separate camera attached to the main telescope) is also easy -- if care is taken to polar-align accurately. Using the hand control to guide at high power with your main telescope assures good star images, even with long telephoto lenses. Short exposure PRIME FOCUS PHOTOGRAPHY can also be done with a Single-Axis Platform. This is particularly useful to those doing CCD imaging and video camera photography. 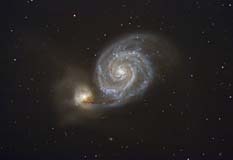 Long exposure PRIME FOCUS PHOTOGRAPHY through the main telescope requires a fine guiding motion in declination as well as right ascension. For this purpose I have developed a DUAL-AXIS PLATFORM which provides an approximate declination motion for a large part of the sky, especially near the meridian. The hand control gives a backlash-free fine guiding motion in declination. Also at your fingertips is a fast slew which, together with the right ascension slew, facilitates centering objects and sweeping an area at high power. 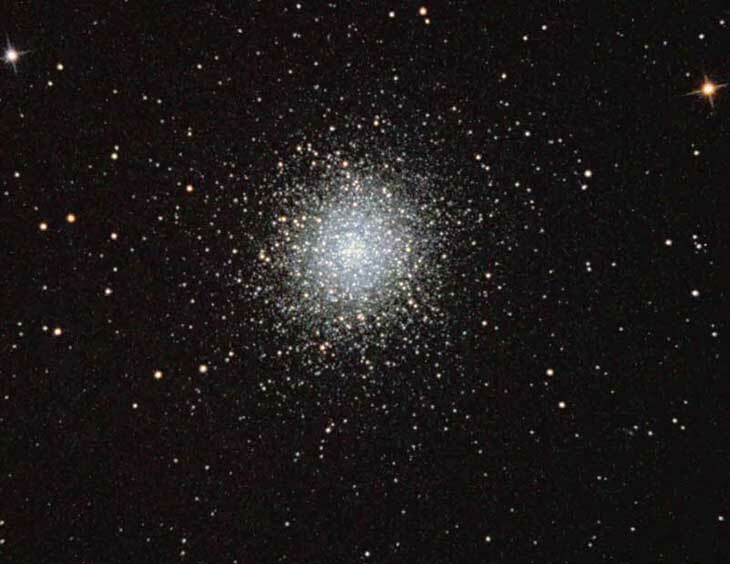 M13 -- a 10 minute exposure through a 16" f5 Dobsonian on a Dual-Axis Equatorial Platform, Ektar 1000 film.